I love how our library try to introduce books to patrons in a convenient way. For my neghbourhood's library there is this shelf near the Borrowing Station where they will place books of different genre for both adults and kids. Couple of months ago while DinoBoy was busy checking out the books at the Borrowing Station I was browsing at the Recommendations shelf and saw this book. I took it up to check it out and it ended into our pile of books that we borrowed that night. Ok I admit that I'm a visual creature, its in the blood not my fault, anyway as I flipped the pages and admiring the illustrations I get more exited. The illustrations are so whimsical, lifelike and full of facial expressions that depicts the character's mood in the story. These are the kind of illustrations that I like because it draws me to not only read the book but study the characters while reading the story. 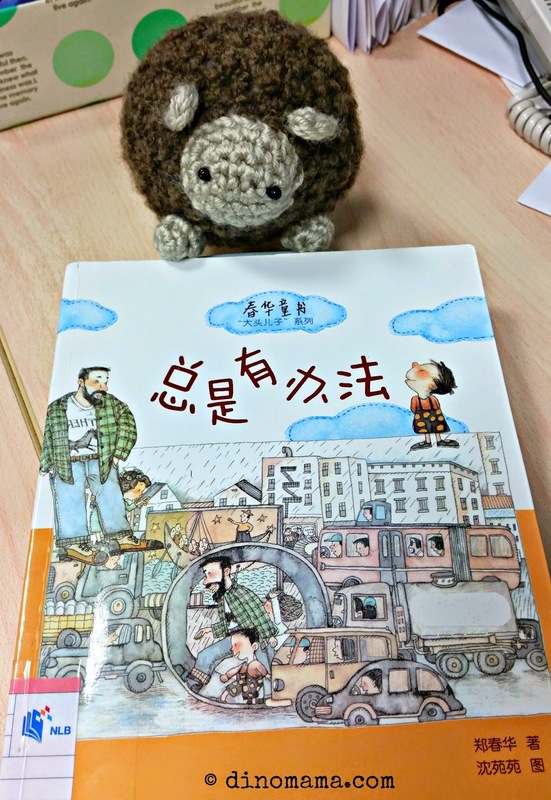 And since DinoBoy is some what a visual creature too, again through no fault of mine lol, I noticed that illustrations help him to get connected to the story because he still have trouble recognizing some Chinese characters and understanding their meaning. Anyway, another reason why I like this book is because it consist of short stories (max 4 pages) of interesting title but with simple and lively story line, the words the author used are easy to understand too. The characters has no name, instead they have nicknames; 大头儿子 Big Head Son, 小头爸爸 Small Head Dad, 大大叔 Big Big Uncle.小眼睛 Small Eyes and 胖外婆 Plump Grandma etc. DinoBoy finds their name very funny and wants to read more about their story. The recommended age for this book as stated in dangdang is for 7 to 10 years old but it's a little bit challenging for DinoBoy for him to read alone, I have to read it out with him but he understands the story well. 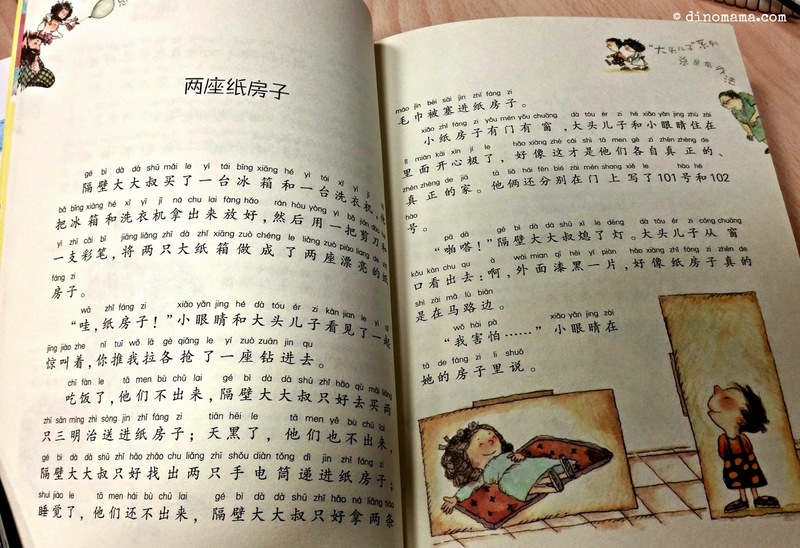 If your child is good in Chinese he will definitely enjoy reading the many adventures Big Head son had with Small Eyes. I googled about this book and found out that the author is from China and the characters are based on a typical China modern family. 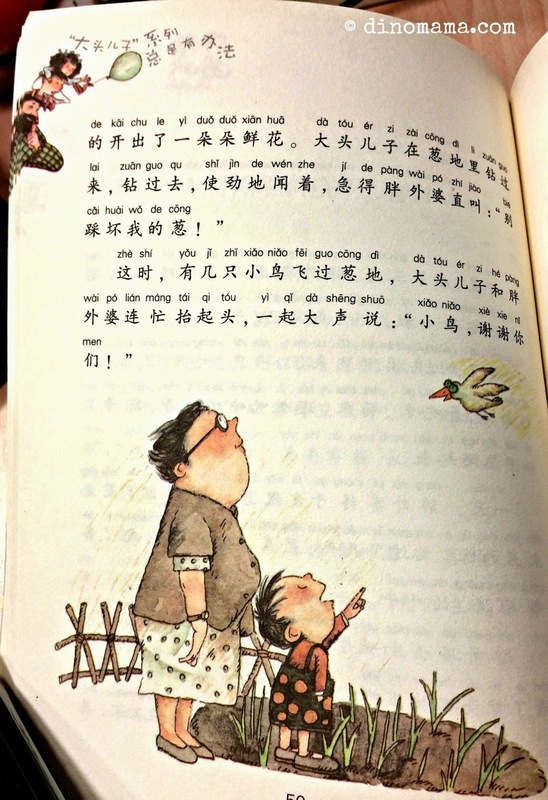 There is another book to this "Big Head Son" or “大头儿子”series, its "我们一起哈哈笑". This author has other series of books too, “米球球”系列, “卷毛头”系列, which you can easily find them from online shops such as dangdang or taobao by these words or “春华童书” as keywords to search. Sounds like a cute book! Thanks for sharing, Jen. No doubt, the HYPY would surely be useful for ME! I used to NOT like books with HYPY because I'd rather DinoBoy learn the words then rely on HYPY to read the words. However I soon realized that he can't do that because the school teachers them HYPY first and so the so call habit was instilled already.